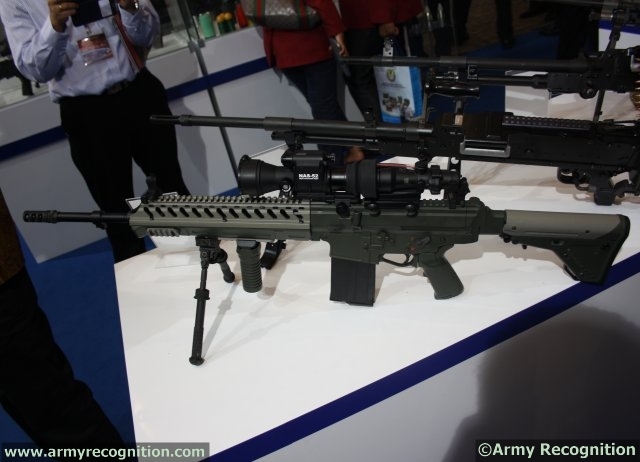 At IndoDefence 2014 in Jakarta, Indonesia-based company Pindad is increasing its assault rifles range by officially showing for the first time a new SS variant, the SSx 7.62mm. This rifle is part of PT Pindad focus and long effort to develop its own weapon with a bigger caliber to fulfil new challenges as required by its users. PT Pindad has initally successfully produced its series of assault rifles e.g. SS1 and SS2 with 5.56 mm caliber. This new prototype is a commitment of PT Pindad management to support both of its domestic end-users within Indonesian National Armed Forces as well as global customer demand. The SSx is a 7.62x51 mm caliber gun, of which barrel measures 510 mm. It can be used with three firing modes: single shot, full automatic and safe modes. The SSx uses MU 2 Tj ammunition, allowing an effective range of 950m. The future Pindad's 7.62 mm assault rifle has optical sight and flip up sight, and can be used with a tripod.